Mr. Crappie monofilament line is field tested and approved by Wally Marshall. This line is super strong and is designed specifically for small reel usage. It is made from an extremely abrasion resistant formula which makes it the perfect line for crappie fishing. 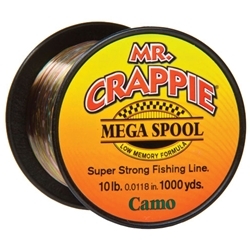 The Mr. Crappie line has low memory which increases casting distances.